Still don't know where the customers are. How do you fill the orders? If you have completed an order you move up to the very last room. The customer is sitting there. Then you bring the food to the mouth of the customer. Ah... mouth of the customer. I couldn't figure out what it was. How do you stuff it into the mouth of the customer? It is indeed a little bit of a weird mechanic but. the customer is basically sort of a baby. You have to face the customer while holding the food and then it will disappear, and you will be rewarded with a coin. 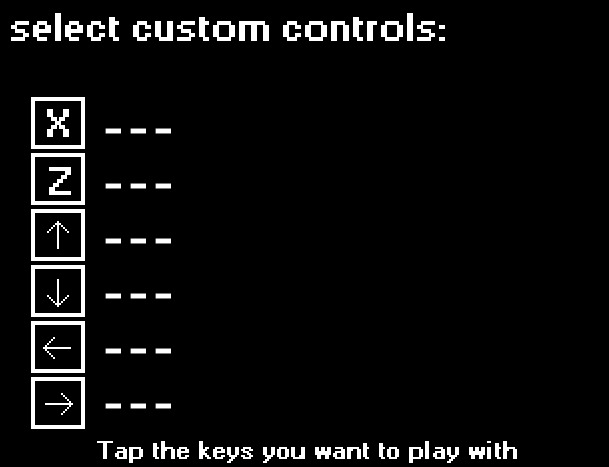 The player can now choose with which keys they want to play. thanks to Henryetha for pointing it out. 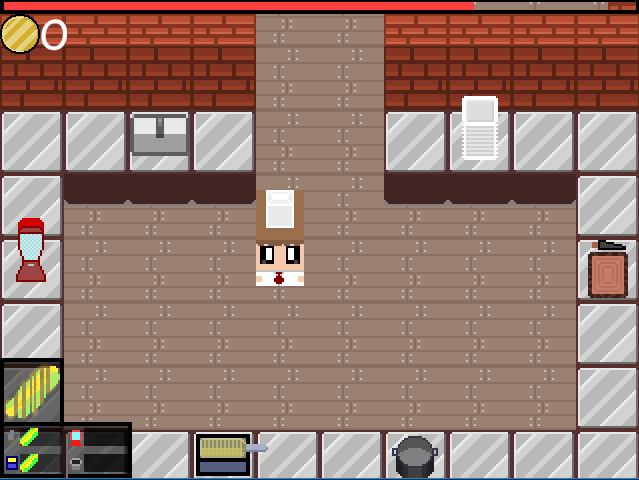 the game has been updated, only custom key mapping is proving to be quite difficult. But it isn't impossible. posting a little update vlog. 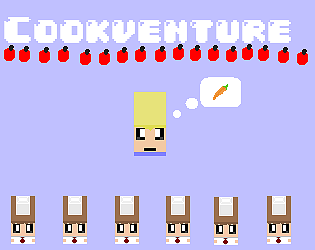 I have redrawn most sprites and I have given the gui a make over. 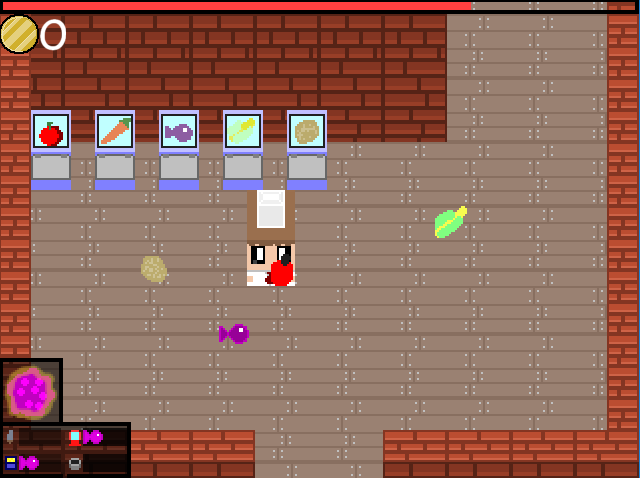 I am currently working on dishes which compose out of multiple ingredients like a fish and potatoe. I guess I will update the game on itch.io very soon . It took some effort to get into the game mechanics, not too long tho, it was ok. For a better playability I'd suggest a config option to change the Z key, on a german keyboard (and don't know how it is on others) we have Y and Z reversed which make controls significantly harder. Many games have that issue tho. As mentioned before, the game has potential. I imagine possible upgrades, more machines, more ingredients, different customers with different behavior, and and and... possibilities are nearly endless. As for graphics, I like the simplicity, especially on food items and how they indicate clearly, how the food item is prepared. The music.. can drive one crazy if playing for a longer time period. So if intenting to expand the game, I'd consider another BGM or at least pauses or changes. I will look into custom key mapping. I guess I should be able to implement that, I might look for a few songs to give the music a little bit more variation, thank you for your comments. Thank you for your comment, I will spice it up ;). I haven't played Overcooked, so I can't say how your game compares to it. But your game has some promising mechanics from what I've explored (you can chop and fry the food to give to customers) but those mechanics (1) aren't explained in-game and (2) more importantly, aren't used at all. I understand the game's unfinished, but why have these mechanics if they won't be used? 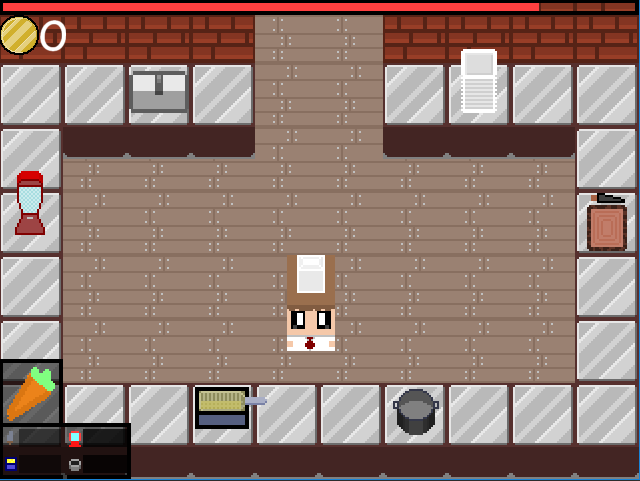 Perhaps cut out the kitchen entirely until it can be used in the game. As for the the mechanics that are used . . . ehhhhhh. You can take a fish, carrot, or apple to feed to a customer who wants a fish, carrot, or apple (it seems to be random which food they want). I kept running into a glitch with the apple box-thing: when I pressed x to take an apple and walked right to go to the customer, I also took a carrot, holding both, and couldn't feed the customer. I also kept running into a glitch where I would drop the food through the customer instead of feeding it to them. Also, when I had 2 foods in my hand, I would drop the apple on the side, but I couldn't pick it up later--I had a pile of apples next to the customers when I closed the game. Overall, I'm not too fond of this game. I did the same three things over and over, and didn't find it fun. I was hoping for more depth--heck, maybe a win/lose state, or a timer, something like that. But personally I found playing this to be rather boring. Thanks for your tips. I am currently updating the game. the kitchen will get a purpose ;), I have also fixed the bug you noticed thank you for reporting it.